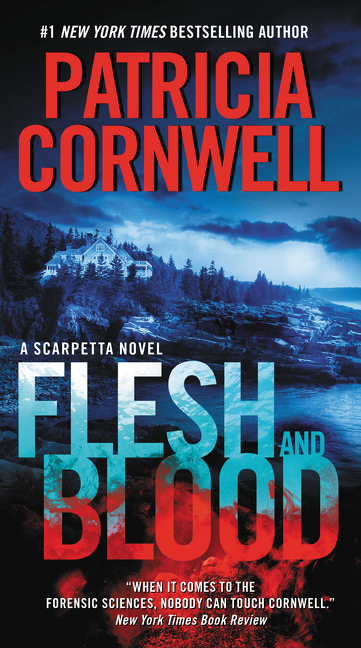 I’ve been a Kay Scarpetta fan since Postmortem was released in 1990 and I jumped at the chance to review Flesh and Blood. Author Patricia Cornwell has always been a masterful storyteller who could keep me up all night to finish her books in one sitting and leave me too terrified to go to sleep when I did finally finish. I expected the same from F&B. Flesh and Blood has an interesting premise. Cornwell sets the scene well with what promises to be a suspenseful and terrifying murder mystery and I really enjoyed the first half. But somewhere along the way, the plot was sacrificed in favor of modern gadgetry and digital subterfuge that undermined the story. Scarpetta is a forensic medical examiner who solves complicated crimes by following clues she uncovers during autopsy and the subsequent investigation. In F&B, she didn’t autopsy a single victim, relying instead on the work of others, which is out of character for her. Her detective partner, Marino, was a hot mess who couldn’t pick up on the simplest non-verbal cues from Scarpetta even thought they have worked together for what seems like 20 years. And her FBI profiler husband Benton and tech genius niece Lucy were too concerned with hiding important information from Scarpetta than using what they knew to actually solve the crime. I was really disappointed in the professional performance of all of them. Which upsets me, because I love them dearly. Flesh and Blood was full of cool high tech toys and modern forensics, but was lacking in flesh and blood. Devoted fans of the series will overlook its flaws and hang on the cliffhanger ending until they can pick up the next book, but new readers may not be convinced. Thank you to Partners in Crime Tours for letting me be a part of this tour! I, too, started at the beginning of this series way back when, but missed quite a few of the middle entries. Looking forward to catching up with this one, though!